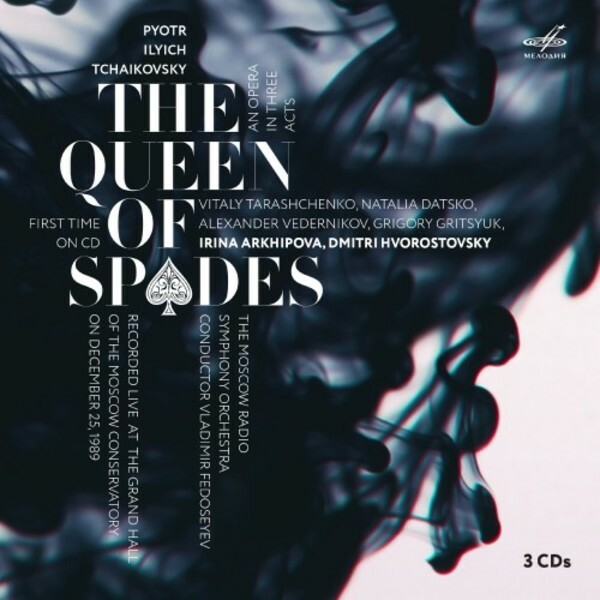 Melodiya presents a unique live recording of Pyotr Tchaikovsky’s The Queen of Spades. This is a concert performance that took place at the Grand Hall of the Moscow Conservatory in December 1989 and featured the Moscow debut of Dmitri Hvorostovsky. “…The power of talent and beauty, nobility and sincerity, the power of fate and destiny made Dmitri Hvorostovsky a close person to millions of people worldwide, not only to opera aficionados”, said opera director Dmitri Bertman about Hvorostovsky. The singer, who sadly died in 2017, is first of all known as a performer of the operas written by Verdi and other Italian composers. In the meantime, it was Yeletsky’s part that was of crucial importance in Hvorostovsky’s career. The young singer performed it when he sang at the Krasnoyarsk Opera Theatre. This is also the part that launched his international career in 1988, in Nice, France. Yeletsky’s aria also brought him a triumphant victory at the international competition in Cardiff, UK, in 1989. Hvorostovsky continued to perform in the productions of The Queen of Spades on the world’s greatest opera stages such as Mariinsky, Metropolitan Opera, Vienna State Opera, La Scala and Covent Garden appearing together with outstanding musicians. This performance of The Queen of Spades also features Irina Arkhipova, a prominent Russian singer of the second half of the twentieth century, Vitaly Tarashchenko, one of the best Hermans of the 1980s and 1990s, and Alexander Vedernikov, the Bolshoi’s celebrated bass. The Moscow Radio Symphony Orchestra and the Yurlov Republican Academic Choral Capella are conducted by Vladimir Fedoseyev. The live recording of the concert performance of Tchaikovsky’s opera is officially released by Melodiya on CD for the first time in three decades. We are confident that it will find a fitting response from the music lovers and take a proper place among the other golden recordings of domestic performing art.